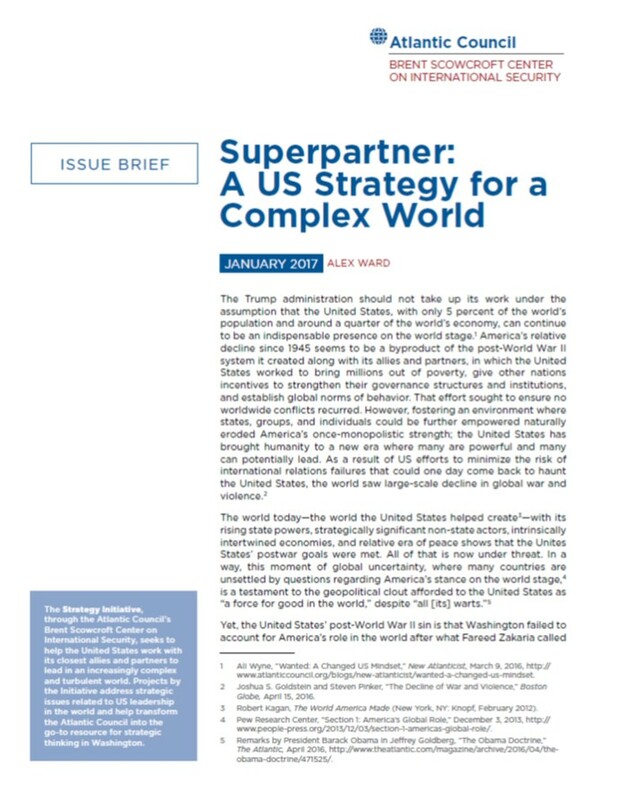 The Trump administration should not take up its work under the assumption that the United States, with only 5 percent of the world’s population and around a quarter of the world’s economy, can continue to be an indispensable presence on the world stage. America’s relative decline since 1945 seems to be a byproduct of the post-World War II system it created along with its allies and partners, in which the United States worked to bring millions out of poverty, give other nations incentives to strengthen their governance structures and institutions, and establish global norms of behavior. That effort sought to ensure no worldwide conflicts recurred. However, fostering an environment where states, groups, and individuals could be further empowered naturally eroded America’s once-monopolistic strength; the United States has brought humanity to a new era where many are powerful and many can potentially lead. Energiewende: From Germany’s Past to Europe’s Future? Germany’s historical experience explains how the energy transition (Energiewende) came about, and largely explains the resilience of the policies to abandon nuclear power and to scale-up renewables in the face of the challenges they have posed to Germany’s consumers, utilities, and international competitiveness. Whereas the success of the Energiewende to date has come from the way it takes a unifying approach to energy, environment, and labor policies, its success will require expanding the scope from a German to an EU-wide scale. 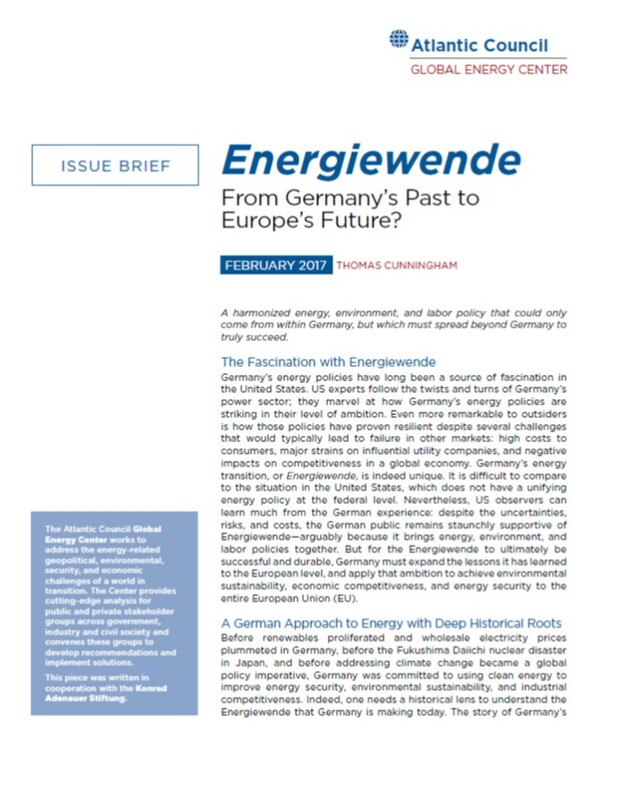 Read more about Energiewende: From Germany’s Past to Europe’s Future? In theory, the interests of US allies and partners in Europe and Asia should be aligned. 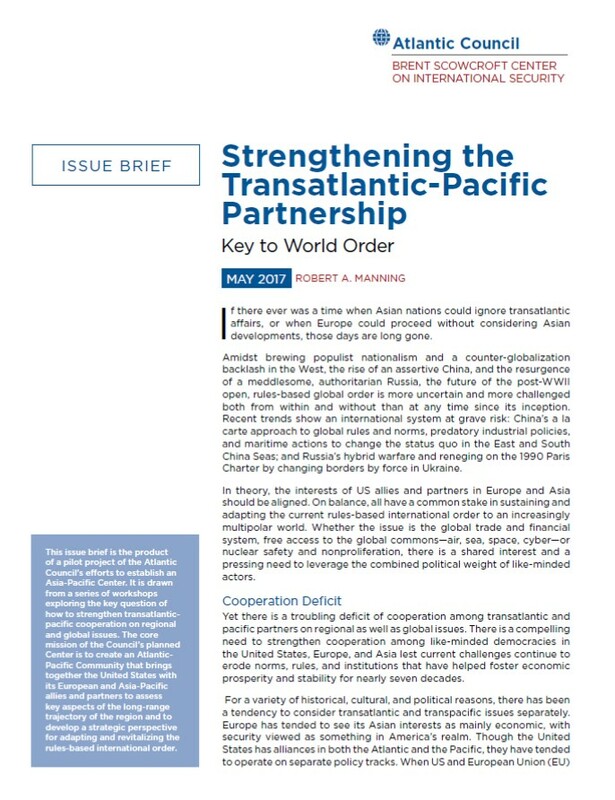 On balance, all have a common stake in sustaining and adapting the current rules-based international order to an increasingly multipolar world. 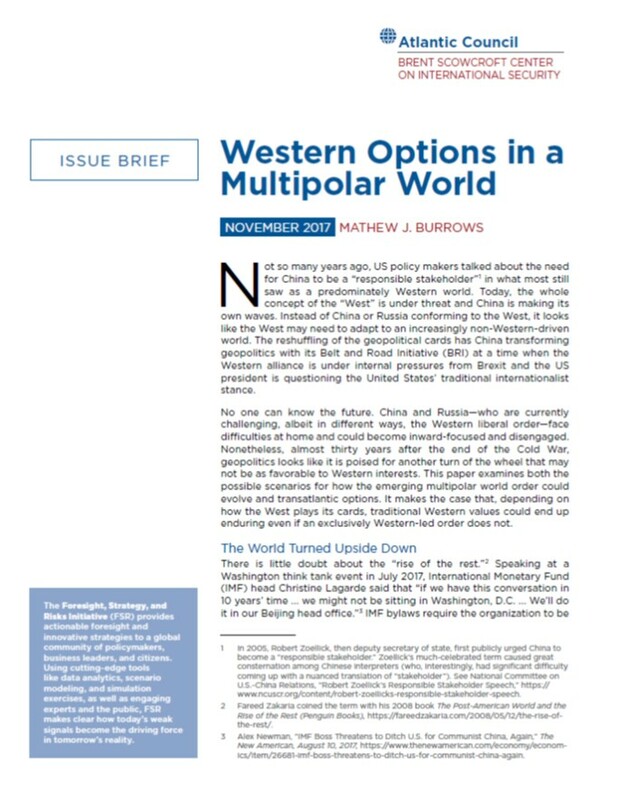 Whether the issue is the global trade and financial system, free access to the global commons—air, sea, space, cyber—or nuclear safety and nonproliferation, there is a shared interest and a pressing need to leverage the combined political weight of like-minded actors. 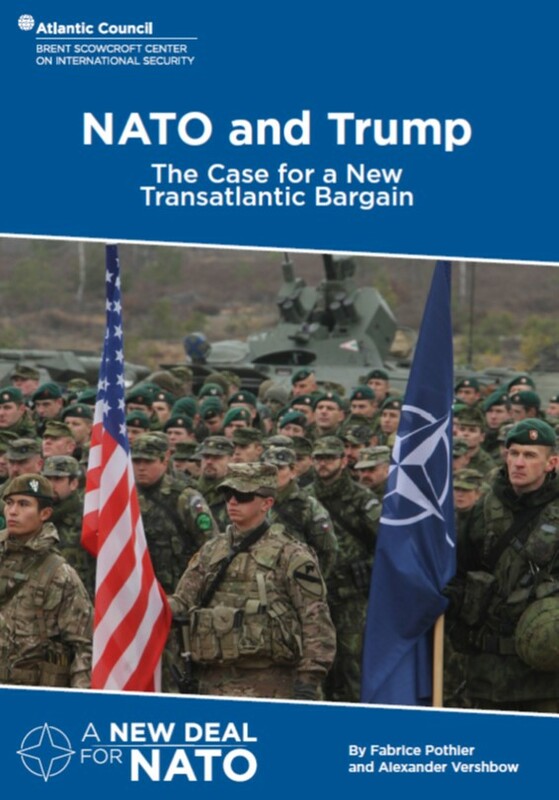 A turbulent security environment in Europe and strong rhetoric from President Trump have brought renewed attention to NATO, its role in dealing with shared security challenges, and the future of the United States’ relationship with its allies. Front and center are legitimate questions about commitments to defense burden sharing, as well as NATO’s role in counterterrorism. This serves an opportunity to renew the transatlantic security relationship. As part of the Atlantic Council’s project ‘A New Deal for NATO,’ NATO and Trump: The Case for a New Transatlantic Bargain provides pivotal insight and recommendations on how the United States and European allies can move forward to renew the transatlantic security and defense agenda, and make progress on these crucial areas, with the goal of bolstering our shared security. US energy policy is on the brink of a dramatic shift as President Donald Trump seeks to dismantle the Obama Administration’s environmentally-friendly energy initiatives, remove environmental and climate concerns from US energy policies, and reorient focus on producing low-cost energy and creating American jobs. 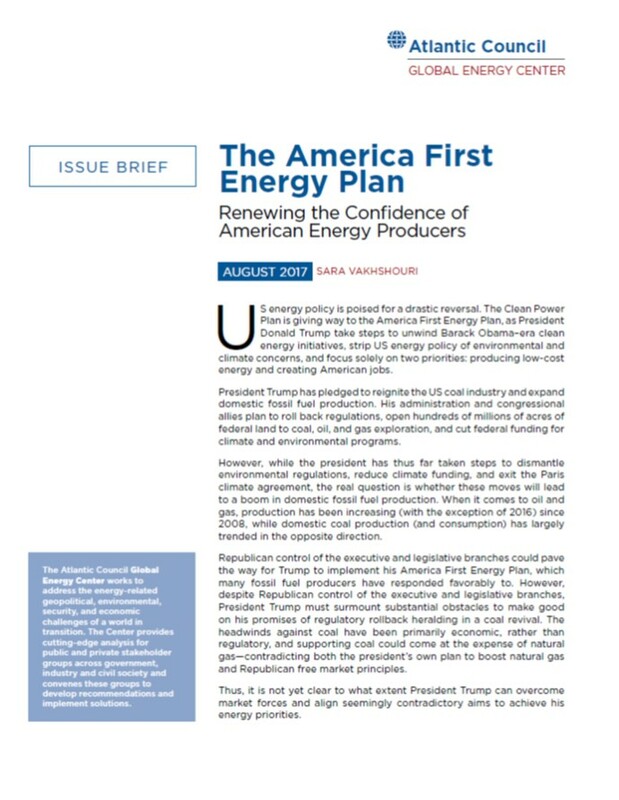 To achieve the desired increase in domestic fossil fuel production and energy employment, President Trump, his administration, and his allies have promised to implement the America First Energy Plan, intended to reinvigorate the US coal industry, expand domestic fossil fuel production, cut regulations, open federal land for fossil fuel exploration, and reduce federal support for climate and environmental programs. No one can know the future. China and Russia—who are currently challenging, albeit in different ways, the Western liberal order—face difficulties at home and could become inward-focused and disengaged. Nonetheless, almost thirty years after the end of the Cold War, geopolitics looks like it is poised for another turn of the wheel that may not be as favorable to Western interests. The great Asian paradox is that a region steadily becoming more economically integrated is filled with distrust, competing nationalisms, and territorial disputes in the security realm. This is epitomized by Northeast Asia and the North Pacific: the region features the world’s three largest economies; three of the largest militaries; three of the five declared nuclear weapons states, and one de facto nuclear state. 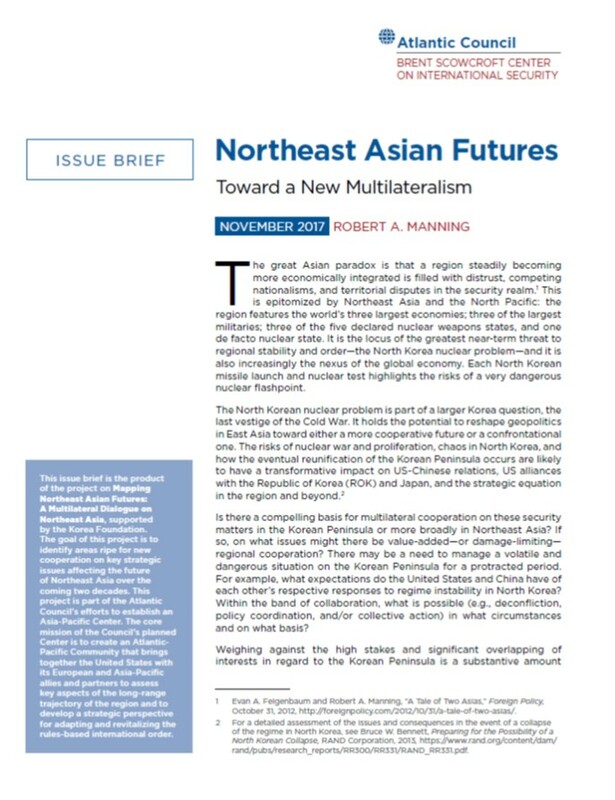 It is the locus of the greatest near-term threat to regional stability and order—the North Korea nuclear problem—and it is also increasingly the nexus of the global economy. Each North Korean missile launch and nuclear test highlights the risks of a very dangerous nuclear flashpoint. Disruptive technologies—such as the Internet of Things, robotics, and three-dimensional (3D) printing—have been heralded as the future of the global manufacturing sector. However, in Africa, they could hinder industrialization and result in fewer entry points into global supply chains. While it may be possible for African nations to “leapfrog” directly to newer technologies, it is more likely that developing the relevant worker know-how, infrastructure, and corporate capabilities necessary to leverage the potential value of these technologies will be a very gradual process. African policy makers must therefore pursue multipronged strategies to ensure relevance as 3D printing and other disruptive technologies move into the mainstream. The world is on the cusp of an unprecedented technological revolution, one that will have far-reaching social, economic, and geostrategic consequences.How the United States and other major actors position themselves as innovators and adaptors of emerging technologies will determine their economic fate and geostrategic standing. This report seeks to answer the fundamental questions raised by the unfolding technological revolution. The key recommendations in this report deal not just with the potential problems between states, but also address some of the inequities that are growing within societies due in part to emerging technologies. In an age of transatlantic tensions over the Iran deal, trade balances, and steel tariffs, digital policy is uniquely poised to offer opportunities for greater US-EU cooperation. At the same time, the digital arena also has the potential to be a policy minefield, with issues such as privacy, digital taxation, and competition policy still unresolved. 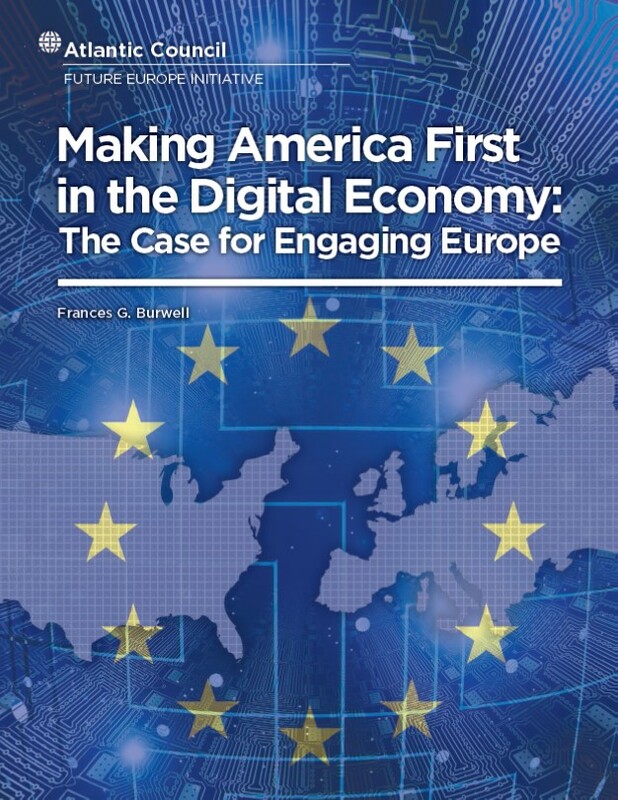 Making America First in the Digital Economy: The Case for Engaging Europe addresses these challenges and explores how the US-EU digital agenda fits in the larger transatlantic relationship.